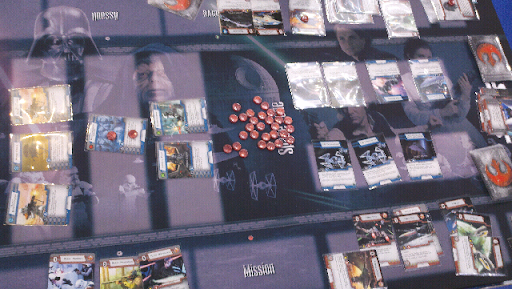 This game was a letdown (though not nearly as much as the new Star Trek card game). It is another co-op game where both players are Rebels collaborating to complete a multi-phase mission while fending off attacks by the Imperials. This game has a lot of the "taste" of Star Trek: Expeditions. I'm told it is also extremely similar to the new LotR card game by the same company. Maybe I'm just discovering an inner wargamer I didn't know was in me, but when I play a two-player Star Wars game as the Rebel Alliance, I expect to be throwing X-wings at my opponent's Tie Fighters. This holding-hands, let's work together, namby-pamby nonsense has no place in a Star Wars game.